To everything there is a season …. 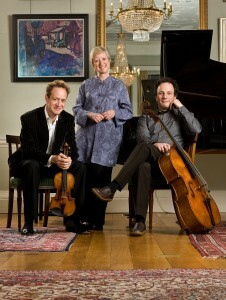 and the Florestan Trio has announced its final season of concerts. We’ll be concluding a year from now with a celebratory Beethoven Cycle in the Wigmore Hall, London. For the full text of the announcement, please click on the Florestan Trio tab at the top of this home page, or visit the trio’s website. We look forward to seeing many of our old friends at this year’s concerts, including the trio’s own festival at Peasmarsh, East Sussex, on 9-12 June 2011. This entry was posted on Tuesday 18th January 2011 at 5:06pm	and is filed under Florestan Trio. You can leave a response, or trackback from your own site. Sadly, I’ve come too late to the Florestan Trio. I had hoped to catch the three of you live some time, but Wigmore Hall is a bit too far from Delaware, USA for me to make the journey. Regardless, many thanks for a delightfully revealing (and moving) series of recordings. You are/were the best thing in piano trios since the Beaux Arts. There is such a difference between an established trio that works and develops together and three distinguished soloists who get together to play trios after a rehearsal or two. In the domain of the string quartet this is very clearly accepted. After 2011 we will be missing the Florestan approach, with its brilliance, its thoughfulness and all the hard work that goes into producing that incredible ensemble work, that astonishing composite sound. Your concerts have always been what concerts should be…riveting. Good luck for the future.